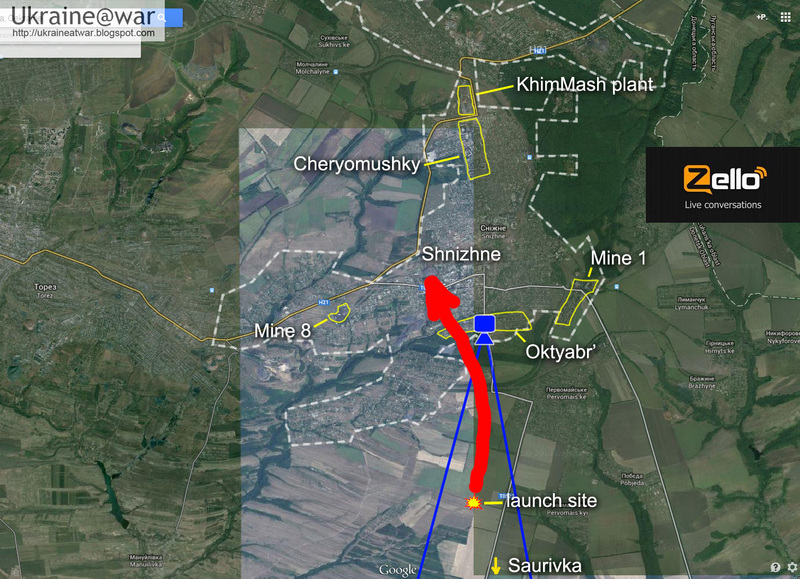 Tapped Zello conversations of (pro)Russians in Snizhne confirm that a rocket had been launched to bring down MH17. Roger, guys, a plane has crashed. There was such a loud bang when it crashed! Even the KhimMash plant (Wikimapia link.) has rattled and trembled. Hey, one plane downed, others won’t fly here anymore? Five seconds, please, comply. [—Zello channel rules?] And no passenger [plane] was shot down. Twenty-sixth [AnN26] was shot down, a transport plane. Good riddance. Was there a sound of a jet plane at all? Perhaps it was an UAV [drone]? UAVs don’t fall [crash] like that. Guys, moderators, this boom, tell me, please, was the plane shot down above Torez, or did something fall down on the plant in Snizhne? So, there’s information, information, that Sushka [— slang for “Su”; meaning a Ukrainian fighter jet] has shot down this AN26 with foreigners. I was just going to say, couldn’t one plane shoot down another one? And... is this provable, that this could happen? Or is this... I don’t know, just some guess­work? That, we’re going to find out from the news. The most important thing is that the plane has crashed. So they won’t blame us later that we have [shot down] humanitarian [aid], you know, those who are helping, we’re killing. That’s what might happen. Well, it appears everybody saw where the missile has flown from. Well, where you are, everybody saw it, but the Ukrainian media, as usual, will say, will say that that were us. Guys, a war is going on. Shot down... they were told, don’t fly! Guys! I’ve just listened to the story... (sigh) Right then, I was at the garden, at Oktyabr’ (no Wikimapia link available) sound, out of nowhere, there was droning sound. It was silent right before that, and then suddenly there was loud droning sound... I [looked] at the sky, err, something was flying... well, I, I can’t tell for sure, well, from that direction, it was flying as if from Saurivka [Wikimapia-link]. I thought it was a missile, ran inside the house, shouted to my mom, well, after we went down to the basement, only then did we hear some bangs, explosions. But it was flying and smoking—with a white smoke—and strong buzzing loudly above Oktyabr’ flying there, you know, to... towards the town, in that direction. Mine 8 (Wikimapia link), roger. Well, I was also standing at the balcony and watching. It [the plane] was flying, smoking in the clouds, then black smoke, well, naturally, there was a bang at that time, and it crashed... behind Cheryomushky (Wikimapia link), and further. Well isn’t there [something] from that district, somewhere, well, in the direction of the first mine, there, perhaps, something has fallen there? err, I heard strong buzzing, flying there, towards the town. No, it [the plane] was hit, it didn’t drop anything. That’s not what’s important! Here: “On July 8, State Aviation Service of Ukraine has closed the flight space in the east of the country. The decision was motivated by the ongoing military operation in the region.” How can they possibly complain about the militia [separatists]? So first of all, this is a confirmation of the scenario that we have seen from the official Russian commanders: they think a Ukrainian military plane had been shot down, they cheer about it, only to find out it was a mistake. But more important is that they are witnessing of a rocket being launched and they have seen it flying over the city of Snizhne into the direction where we know MH17 has been flying. Most specific is woman B, because she tells where she is, at Oktyabr’, which is the southern district of Snizhne. When she is looking into the direction of Saurivka, which is south, she sees a rocket launch. This fits PERFECT with launch site we already determined. She also says it was flying above her into the direction of the town. Since MH17 was coming from North-West direction, this also perfectly fits. Now you can read the conversations again and see how everything matches :D.
If you see any errors or have additions, or other info, please let me know. [0:00] Подтверждаю, ребята, самолёт упал. [0:03] Ну это, наверное, ребятки с рогатки его подстрелили, молодцы. [0:08] Лётчика не поймали, в жопу не надали ему? [0:12] Так бабахнуло, когда он упал! Что аж завод ХимМаш затарахтел и затрещал. [0:26] Чо, один самолёт сбили, больше другие не прилетят? Пять секунд, пожалуйста, соблюдаем. И никакого пассажира не сбивали. Сбили двадцать шестого, транспортник, туда ему и дорога. [0:39] А, вообще, был звук реактивного самолёта? Может, это беспилотник? [0:44] Беспилотники так не падают. [0:46] <?? ?> модераторы <???>. Ну, скажите мне, пожалуйста, самолет сбили над второй вам один, или в Снежном что-то падало там у вас на завод? [1:22] Значит, проходит информация, информация, что Сушка сбила вот этот Ан-26, с иностранцами. [1:33] А я вот только хотела сказать, один самолёт не мог другой подбить? [1:37] А… это доказательно, вот, что это могло случиться? Или это, на… не знаю, на уровне предположений? [1:47] Так это мы в новостях узнаем. Самое главное, что самолёт упал. [1:51] Чтобы нас потом не обвинили, что мы гуманитарку, ну, те, которые помогают, тех и убиваем. Вот что может быть. [2:00] Ну, вроде бы, все видели, откуда улетела ракета. [2:04] Ну это у вас все видели, а украинские СМИ, как обычно, ска… скажут, что мы. [2:10] Ребята, идёт война. Сбили – сказано было, не летать! [2:21] Я думаю, не нужно оправдываться перед укропами. [2:25] Ребята! Только что послушала историю… (вздыхает) Я на огороде была как раз, на Октябре, эээ, услышала гул, ниоткуда взялся гул. Вот, буквально было тихо, и тут сразу гул сильный… Я в небо, эээ, летело что-то… ну, я, я не могу точно сказать, ну, оттуда, как от Сауровки летело. Я подумала, что это ракета, бегом в дом, крикнула маме, ну, в подвал уже спустились, услышали уже потом только бахи, взрывы какие-то. Но летело оно уже и дымило – белым дымом – и сильно гудело над Октябрём туда, как в город, ну, в… как на город, в том направлении. [3:06] Ну, тоже стоял, смотрел на балконе. Летел, дымился в облаках, потом чёрный дым, ну, ясно было, в это время бабах, и упал… за Черёмушки, и дальше. [3:17] Ну а нема с того района, где-то, вот, со стороны первой шахты, там, может, туда что-то <???>? [3:22] Да по нему гукнуло, он ничего не скидал. [3:26] Да дело не в этом! Вот: «8 июля Госавиаслужба Украины закрыла воздушное пространство на востоке страны. Данное решение мотивировалось в ведомстве проведением силовой операции в регионе». Какие могут быть теперь претензии к ополчению?